This residency has been inspiring and artistically productive for me. In broadening my understanding of SciArt, it has pushed me to explore and redefine the connections my art practice has with my love of science. I have thoroughly enjoyed working with Yana and we are already planning another project together. 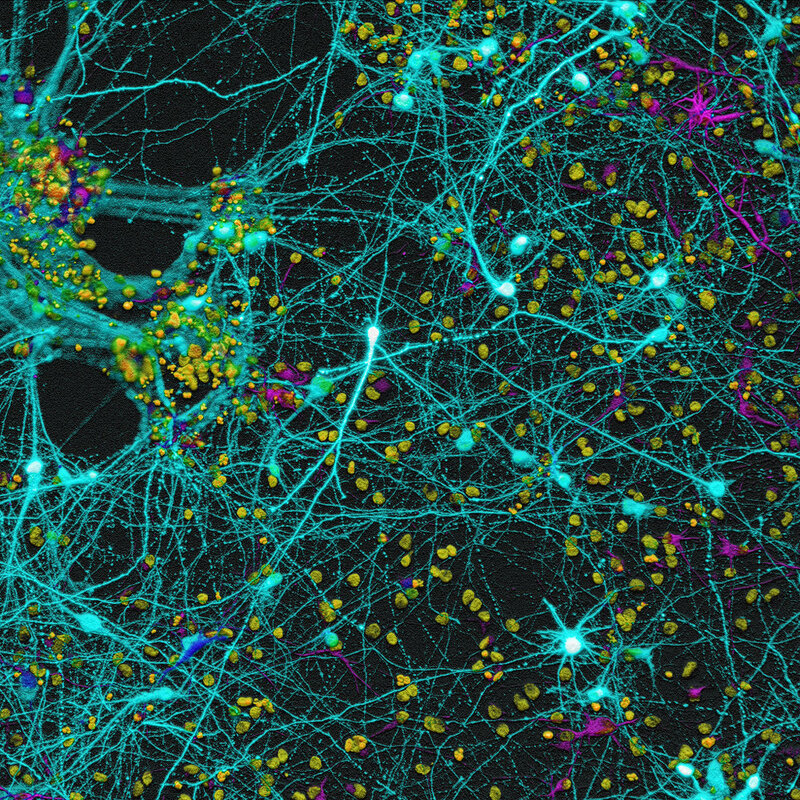 There are endless avenues we could pursue together with neuroscience images and their expression in visual art. During this residency I have wandered through some great books, some for the second time such as Ernst Gombrich (“The Story of Art”), that I have been reading on and off for years. Relatively recently I have come across, Eric Kandel (“The Age of Insight”, “Reductionism in Art”) and Robert Sapolsky (“Behave”). My last two reads were the rediscovery of Alexander Von Humbolt in the passionate voice of Andrea Wulf (“The Invention of Nature”) and then, “The Age of Genius” by a favourite author, AC Grayling. All of these brilliant writers and many more have influenced my ideas and found their way into my own writing repeatedly. The truly interesting thing is to try to remember what my thoughts looked like before my encounters with the rich worlds of science, art, and ideas. Impossible, even though I “feel” like the same person I was at 16 years old or even 10. The intricate reordering of the mind that happens when we corroborate our world-views with others is so pervasive that it is impossible to tease apart. This is a collective understanding that emerges from our social nature, our ability to learn from and influence each other. I value this above everything. It is the hope for the future. To be clearer in our understanding of ourselves, our species and the gorgeous complex living plant to which we are completely connected and dependent. This residency has fulfilled many of these desires and concerns. Yana is an accomplished neuroscientist with the rigorous mind of a scientist and also practicing in the more nuanced inquiry of art. Our collaboration has brought up ideas I have not thought of before and a rich body of imagery that Yana has provided in her microscopy work. The most recent images she has shared with me show cancer cell membrane markers. When I have time to get back into my studio, I want to play with all of the ideas these images inspire. 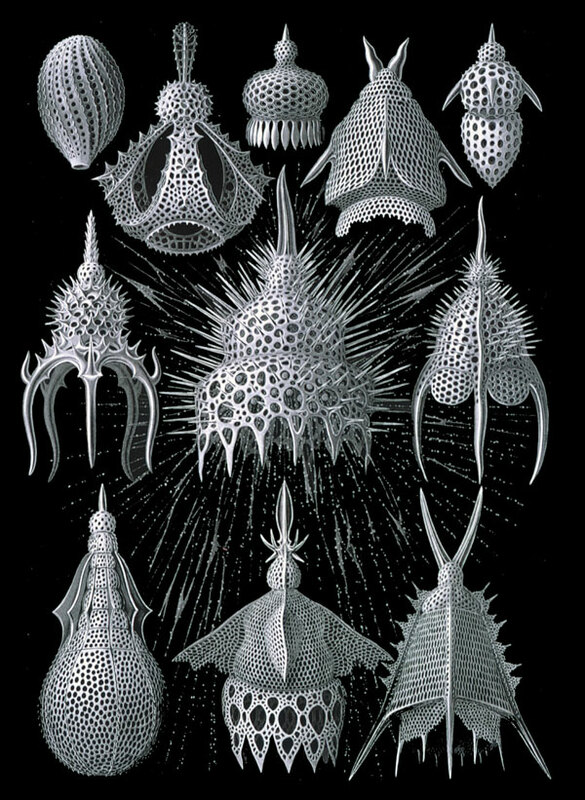 In conclusion, I want to mention that none of the artists I have listed above except Ernst Haeckel do SciArt. I think this is because I look for artists that express the most fundamental desire to understand human perception and our expression of the unique yet still collective internal worlds we all possess. 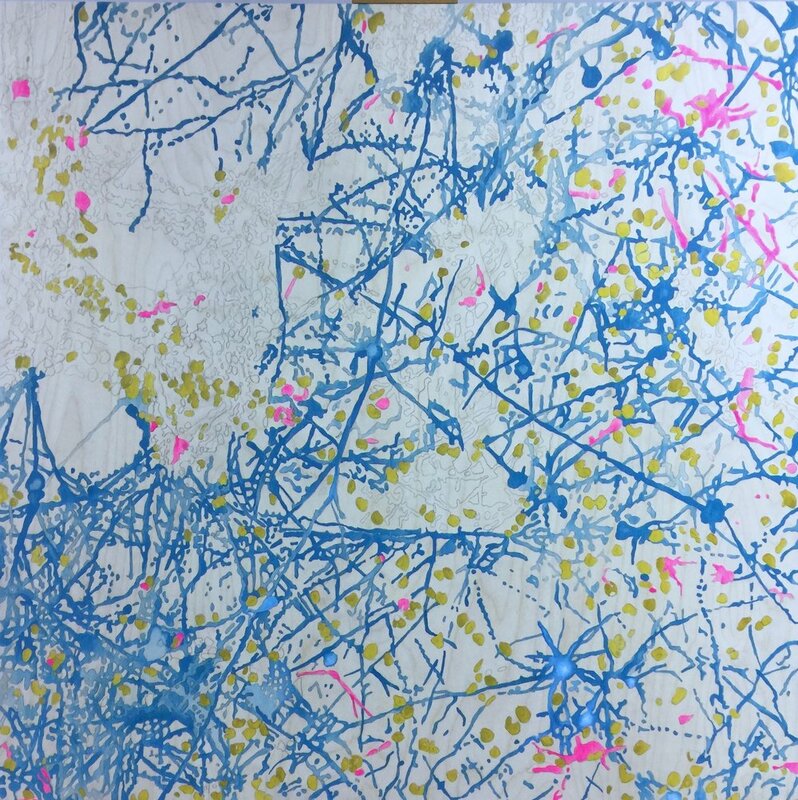 This residency has encouraged me to look deeper into the SciArt community for ideas and understanding about the highly varied work that comes out of this burgeoning field of art. Thank you all for this experience. So here we are in the last week of the residency. I am ready to start a new painting and plan to explore “Where’s the Party?”. This is another collaborative image of Yana’s and mine. This will be the sister painting to “Mapping Manhattan Revisited”, done in a similar way in order to observe the differences in process and outcome. 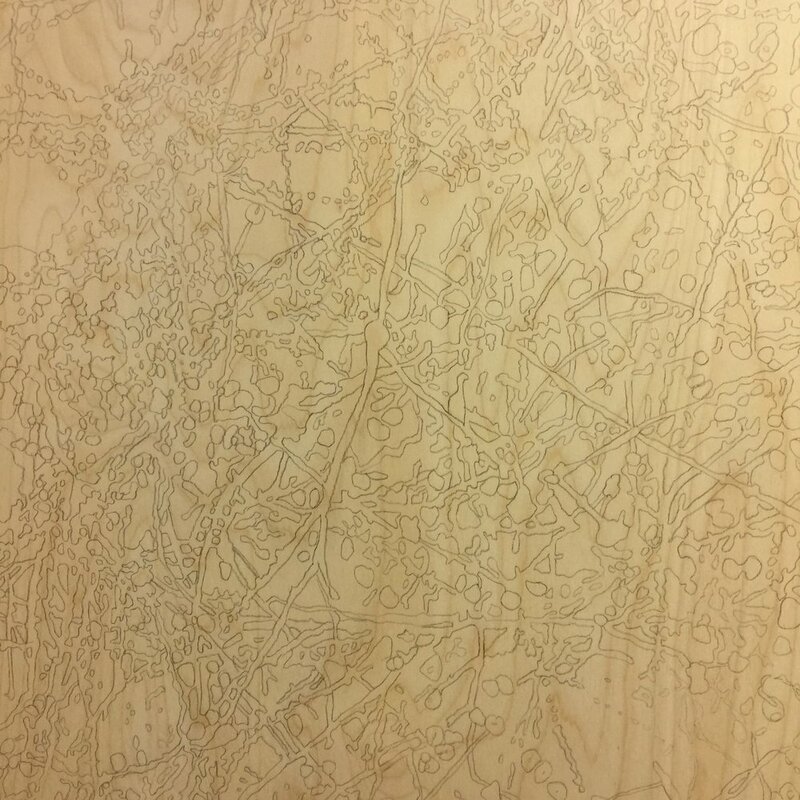 I will start by projecting the image on a 36” X 36” wooden cradle, redrawing the image in graphite, then painting directly onto the wood with an array of bright inks in order to recreate the pattern. I will continue posting the results of this project and others on my personal blog, darcyelisejohnson.com . I have often thought that part of my attraction to science is the structure it provides for new and more complex insights. Scientific thinking gives us a roadmap within which our imagination can act. It is a bit like fleshing out a storyline. The important revelations are in the details. Scientific methodology keeps us focused, organized and withholds judgment until the results are in. Then we bring our intellect and creativity to the results which at the very least, point towards the next step. 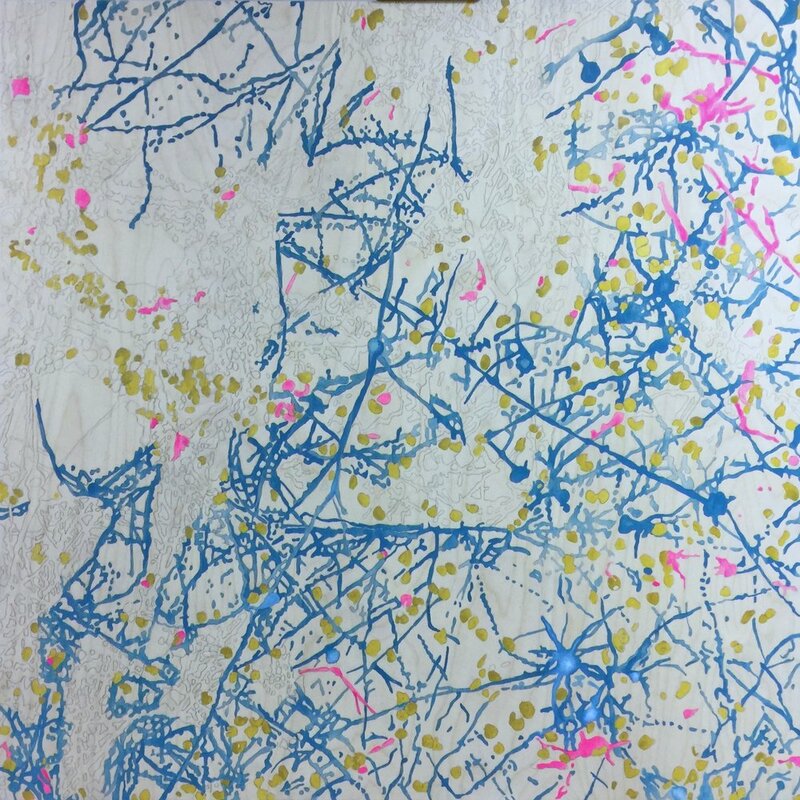 There is another aspect of scientific thinking that I deeply value in my work as an artist. I glean ideas from the rich world of nature and try to understand them through art. I am doing art to study and understand both myself and the world and a rational method keeps me from spinning off the edge of the world in a flurry of colour and emotion. My two halves are always informing each other, the artist saying come on let’s play in the beautiful world and the scientist saying, well, let’s make this playfulness lead us to a richer place because we are bigger and stronger together. So I have finished the painting. 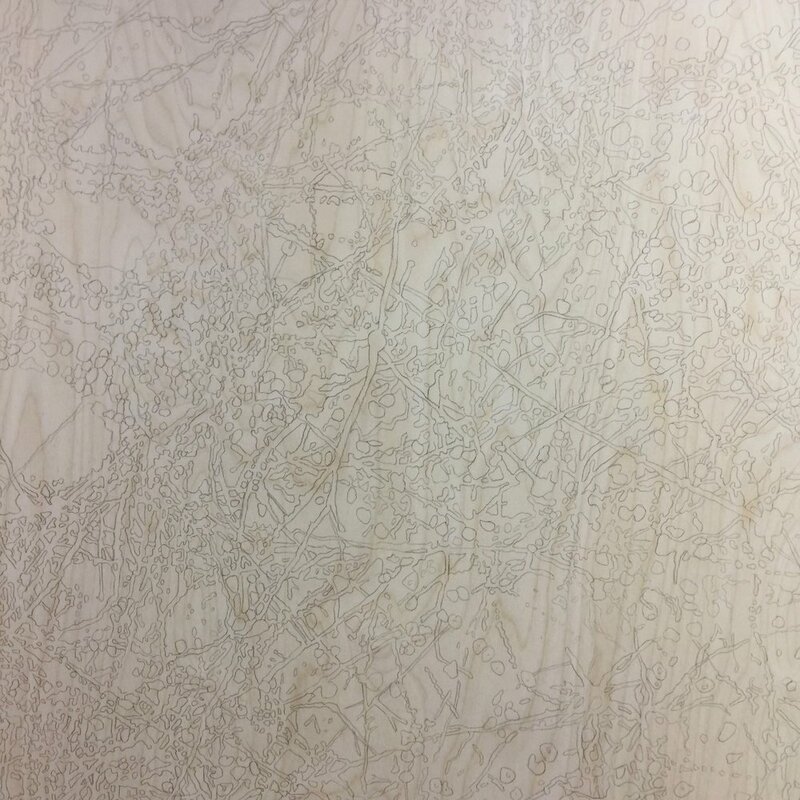 There is a mixture of loss and relief in finishing an intricate piece like this. The questions begin ... “when to stop?”, the... “what next?” and a burst of new ideas that have to be sorted and culled. The hardest question to feel good about is, “what was that all about”? Do research scientists ever feel that way? Well, maybe when things go wrong, but there is always the sense in scientific research that it is always “worth it”. Worth the effort. That it is meaningful and important for human understanding. The sciences and their subsequent applications have made human life easier, healthier and more affluent than ever before. Steven Pinker’s Enlightenment Now gives reams of statistical evidence to this. Science has given us modern medicine, communication, travel, education, improved labour, cultural openness, and leisure, for the arts. The list is inexhaustible as science continues to help solve humanity’s problems. Maybe not fast enough to save our planet home from our thoughtless overuse but worth the effort to try. Better than the alternative. Does art have this same saliency in the modern world? Is art less important than it used to be, before the Enlightenment and the rise of scientific thinking? Do we, or even can we understand what the arts are really for? In this blog series, I have given a number of tries at an explanation. At least, the motivation to do art and the capacity to enjoy the art of others. However, when it comes to my own artwork I am often left mute as to any greater purpose other than to satisfy my own curiosity. This is probably sufficient because it keeps me open, learning and discovering. Many scientists are motivated but just this urge. The desire to know and then, to know more. So in this way, there is equity between the arts and the sciences but I’m not sure that this value extends beyond the communities engaged in scientific or artistic work. I feel that the arts get lost in the noise of commerce. Does science also suffer from this? Science is institutionalized by universities and funding agencies that make it more efficient, rigorous and protected. More and more, the arts are being unhinged from their original institutions. What is the consequence of this? Does it matter that so many of us are out there drumming without the rest of the band? A modern problem allowed by leisure and to some extent, wealth. So...only questions? That is what finishing an artwork does to the artist. I want to just throw this painting out there into the world and with it, some of my inevitable disappointment in its manifestation. I want to discover what others see in it...if anything. Is it meaningful or beautiful? Does beauty matter? Does anyone care? Am I the only one being fed in this process? Is the world making me feel this way or is it simply the ancient struggle of the risk taker. Reading Steven Pinker reminded me that our perception of beauty may be related to our positive response to order as opposed to the more disturbing qualities of chaos. In the living world, we have circumvented entropy for as long as the sun has shone. Time and the sun’s energy drives the increasing complexity of life in an orderly way. Even if we don't survive as a species, other life forms will, until our sun’s energy alters dramatically. We exist in the self-organizing world of nature, which is unusual in the universe where the normal trajectory is towards disorder or entropy. And so we may have evolved to recognize order as a positive part of the process of life and our own survival and then, eventually named it beauty. Understanding our world is what being human is about. What are these recurring patterns? Why are they around us? How is it that we can even think about them? Is this the beauty we all seek, in science, the arts and each other? Although I have never used fluorescent or metallic inks before, I was drawn to them for this piece because of the brightness of the digital image that Yana and I began with (Image # 1). Digitization injects light into an image, making it more luminous than it is. I wanted to somehow mirror that brightness. The interesting thing is that the fluorescent pigments will slowly lose their luminous quality as they fluoresce away their excitability to UV light. The neurons were “artificially” stained before Yana imaged the culture with an electron microscope. (Image #1). I took this image a step further, digitally, to arrive at “Mapping Manhattan”(image #2). Using our respective art techniques, Yana and I are each bringing this scientific image into the realm of the artist. Another important aspect of scientific models is the ability to manipulate various dimensions. In the Week 11 Blogs of Diaa & Stephanos, Stephanos presents his mathematical model of neuronal activity in memory. Mathematical models expand our ability to visualize processes and events that our brains are not capable of holding onto in ordinary circumstances. This type of modelling is a powerful simplification because it allows us to then manipulate variables and that our conscious minds would lose track of within several mental operations. I am understanding this image more deeply and it is becoming a sort of companion. My attention is focused on discovering the intricacies of it. 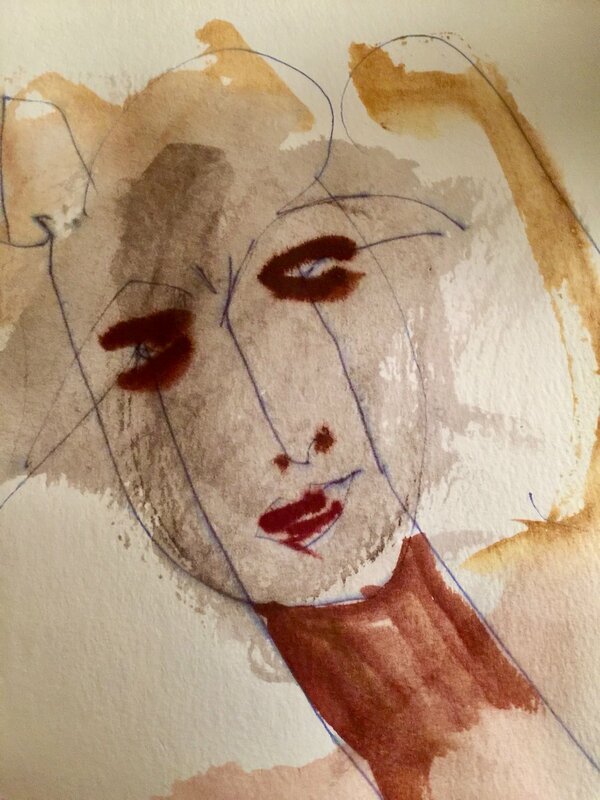 A carefully crafted artwork becomes a manifestation born from an intimate connection between the image and me. I know and care about it. I have just discovered a book on this topic that I am anxious to read, Drawing as a Way of Knowing in Art and Science by Gemma Anderson . Drawing and painting are a type of close observation that requires ongoing interpretation, evaluation, and commitment. Missteps become glaring. I am learning so much about so many things while I work out the possibilities of this piece. I suppose my point is that the process of making art is personal for me and I want to convey that in some way. The viewer, however, only needs to pay attention to the beholder’s share . When I look at this image it inspires so many metaphors for me. These ideas tumble over each other and intertwine in a beautiful, tangled pattern of nature ... both nature out there and the nature inside me. cannot separate out one component from this complex set of relationships because one thing removed, changes both the system and changes the component. Yana’s and my artwork flows from this image and carries our unique responses. In the end, our separate pieces will reveal something of the minds that have created them and our individual interpretation of what is meaningful in the image. I am increasingly convinced that this process is rich with ideas and insight. Progress is slow for both Yana and me because we have both chosen deliberate and meticulous methods. This is good in the end because we can watch our work unfold with time to think about what is developing. For me, this is the point of doing the work. Ideas swirl around in my head and finally, the insights start to gell. This takes time. arts. My stepson, Andrew Cameron (a microbiology professor), he came up with the idea of scientific models as being one of the closest connections between science and the arts. I have previously talked about the arts as being a Gestalt that originates in the right hemisphere of the brain and also the importance of this integrating part of our brain in processing, enriching and storing knowledge. Andrew’s idea is an elegant demonstration of this. A scientific model often takes highly complex and abstract ideas and builds a framework that makes those ideas more accessible because it favours simplicity. An example of this is the cell. The model may simplify the structure and function of the cell makes it more approachable to everyone. A grade 9 science student who has very little previous knowledge of a eukaryotic cell would process the model very differently from a geneticist, a physiologist or a virologist, who would, in turn, bring different emphasis to their viewing. In a scientific model, all the pieces must fit, relate and interact and are less meaningful if reduced to their parts. A scientific model is a testable framework that contains the overall understanding in a particular scientific theory but also acts as a beacon for moving the research forward. A scientist can then go about designing new research, fitting in new information and even predicting what will eventually be discovered to flesh out the model (eg: the Higgs boson in particle physics). Assuming that an artwork is a representation of the artist's abstract and complex experience, it may be a framework similar to scientific models. A work of art contains interrelated and interdependent content for the viewer to grapple with. But art, like scientific models, also exposes holes, such as ambivalence, that allows the viewer to flesh out the artwork and extract personal and universal meaning. This relates to my previous discussion of the beholder’s share developed by Rigel, Gombrich, and Kriss. Great art must leave room in its overall “structure” for the viewer to gain unique insights and in some way light the path forward to new art and ideas. I will carry on with these ideas next week and discuss the organic and dynamic nature of scientific models and art. I suppose my interest SciArt is not only to investigate the ways in which the arts and sciences work together but also to argue that they are critically important to each other and in a sense inseparable. One of the ways I study this intersection is through my own artwork and so will continually return to this theme. During the Age of Enlightenment, as rationalism and empiricism vied for dominance in the scientific approach to knowledge, they both moved science further and further from the arts. This separation has persisted until fairly recently. One of the most important scientists of the Age of the Enlightenment, Alexander Von Humboldt (1769-1859) did not have the attitude that our emotionally dominated intuition should remain out of the picture when trying to decipher the complexity of nature. A close friend of the polymath, Goethe and the philosopher Schelling, Humboldt saw nature as an integrated whole where all organisms and processes are interdependent. According to Andrea Wulf in The Invention of Nature, Humboldt tirelessly explored, measured and wrote about the natural world he experienced through his global travels. His copious writings always contained both close scientific observations of nature and powerful poetic prose. Humboldt allowed his emotions and sense of the connectedness of all things to create a highly accurate and compelling vision of the whole of nature and the way it interconnected. He was even able to show how economies, politics and human-induced climate change are all shaped by the characteristics of the natural world. But most importantly, Humboldt was the first rigorous scientist to point out that humanity is as dependent as any species on a richly diverse planet. The difficulty humanity has in viewing nature in this highly interconnected way is partly because of the way our brains organize our experiences. The human mind seems to use opposites as a way of understanding the world. These can be as simple as bad vs good or as sophisticated as romanticism vs rationality. It is more a mental tactic than a realistic view of the world and grossly oversimplifies the way nature functions. This dichotomizing of concepts, unfortunately, leads to a “this or that”, “us or them” worldview that is misleading because nature (including humanity) is more an integrated and interdependent whole in which opposites are on a continuum and its components are more alike than they are different. It takes hard mental work to avoid these biases. This is exactly why we need the rigours of science to give us a less prejudiced view of nature. Yet science is more powerful and insightful if working with the great integrator ... the arts. So it seems more important than ever that the arts and sciences reunite to create a more complex and less biased view of ourselves and nature. The arts also allow us to be more comfortable with ambivalence and there is more than enough of that to go around! Here is this week’s progress on my the interpretation of “Mapping Manhattan”... I think of Humboldt as I work slowly (and a bit painfully) towards a more resolved image. Excited to see what Yana is coming up with her equally meticulous rendering of this image. imagined. The painting process demands that I pay close attention to the original image because progress is slow. I, therefore, have a lot of time to think about what I am doing. I started with the magenta because it has a distinct pattern and there is less of it than the other colors. I used the magenta structures to orient myself to the whole space and then added the yellow cell bodies. My drawing is such a mass of tiny lines that I have to hunt for every structure. It felt like I was star gazing. I had to find a clear recognizable constellation of structures and work outward from that, painstakingly filling in more and more detail. My drawing will relate to the original electron microscopy image that Yana made but at this point, I am most interested in the degree to which that happens. At this point, it is emerging as a map which reflects perfectly my sense of trying to navigate its structure. This process interesting because it allows me to not only get to know the image better but to observe myself observing the process. I thought about scientific observation mainly. This is because every time we take a data set and translate or distill it, we lose something or at the very least, change something. It is the natural evolution of the information processed by our creative brains that defines the final character of what we call knowledge of the “natural” world. While painting, I could see my self constantly interpreting the image, making choices about what to emphasize and what to forget about. At times, I felt like I was blatantly fudging the data. So, after a number of hours spent “dissecting” my drawing, I was more convinced that the role of scientific observation is to preserve the original data as well as possible because otherwise our creative brains will shape and change it without our conscious awareness. If we are creatively structuring of our reality with only oblique reference to the already filtered data of our senses, we need the rigors of science to keep us in check. Science puts together a solid scaffold we can then jump off of in the search for creative ideas that often must lie outside of scientific methodologies, in scientific theory, new experimental approaches and the arts which can inform all of these. What the work shows us. I have long been fascinated by the content and purpose of an image whether for science or art. What does it teach us? What information does it distill? Why is it compelling to look at? Drawing and painting are one of the ways I can study an image and gain insights into its many interpretations and incarnations. Yana and I had a long Skype conversation this morning. We discussed a reoccurring topic... What is art for? Can artistic and scientific imagery inform each other? What does this say about what we are each working on artistically in this residency collaboration? Questions, questions, questions… the driving force behind both art and science. First, I projected the image Yana and I have decided to work on in our own ways. 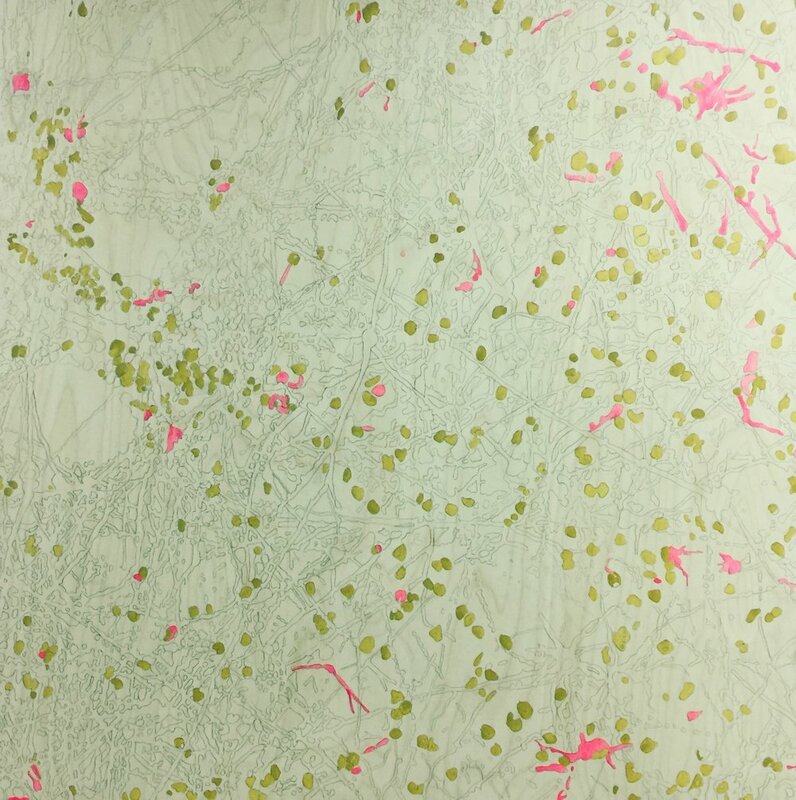 Then, I projected this digital image onto a prepared wooden panel and redrew to. Here is the finished drawing which is waiting in my studio for the first layer of acrylic inks. So, I now have a better understanding of my purpose and direction in this project. It has come from the metacognition we all use, all the time...observing ourselves observing the world. As I was drawing, I became familiar with the image in a deeper way. I gathered details and interconnections. How is my interpretation of this image related to others I have drawn in the past? What details am I focusing on? What type of emotional response do I have to the image and why? What do I choose to leave out, because when we process an image mentally, we must leave things out, we must make choices and it is the choices we make that become the most interesting aspect of the finished work. Again, questions are the most important part of the process. Answer one and another pops up. 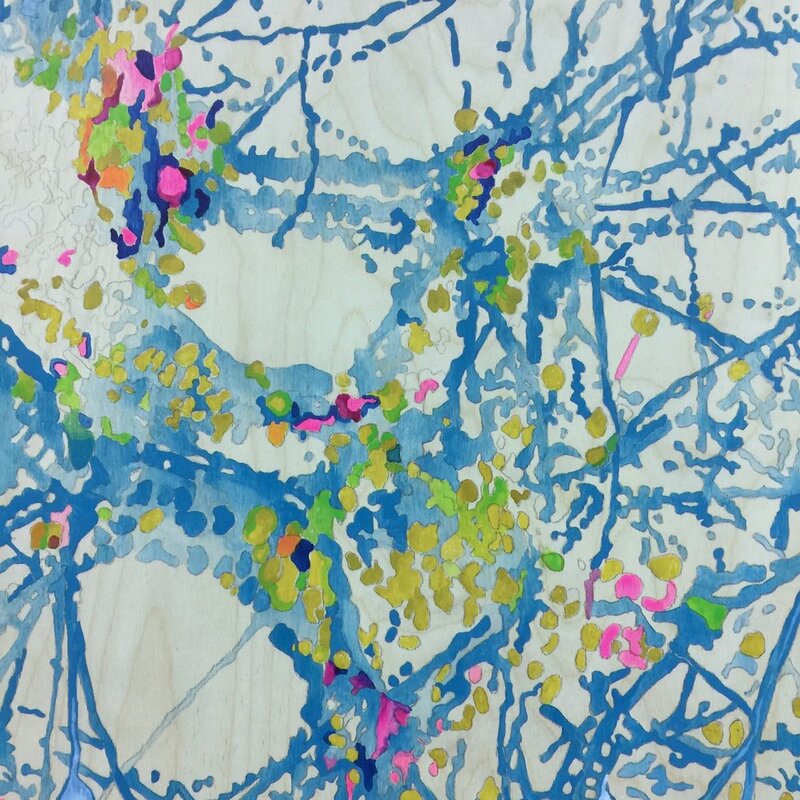 Yana and my discussions and posts are focusing on a collaborative artwork stemming from Mapping Manhattan (Image #1, Yana and Darcy, collaborative work). 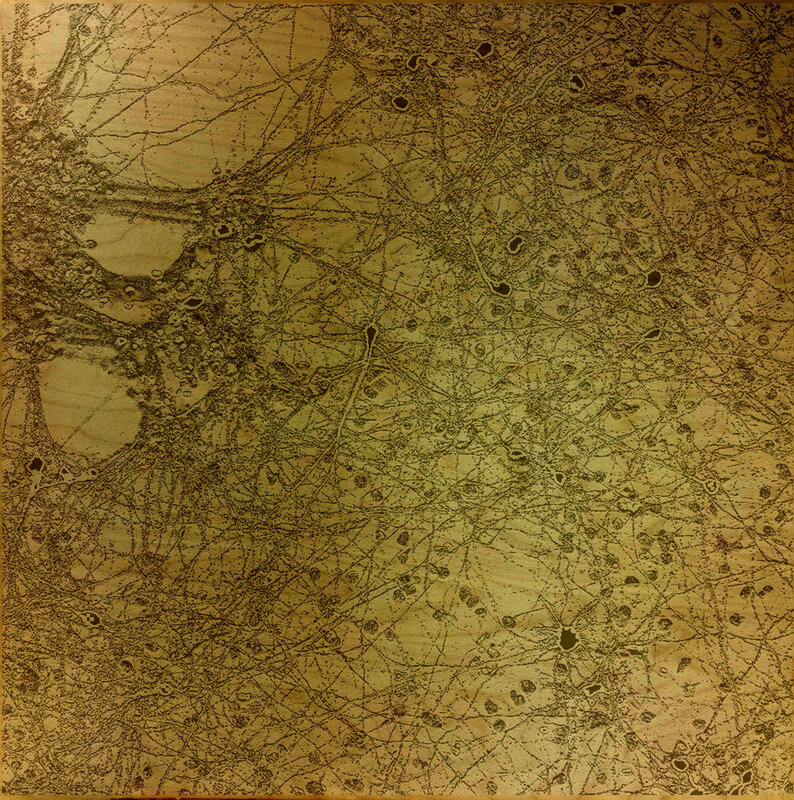 As I talked about in the last post, this is Yana’s electron microscopy image of neurons that was not useful for science but became a playground for artistic ideas for both of us. I now need to come up with my next step in our collaboration. The problem is that I have so many ideas and possible approaches that I feel myself shutting down. This is a universal difficulty with creativity. How to home in on the exact approach and media for an artwork, to the exclusion of others. Because I’m a hoarder of ideas and possibilities in art, it is even more difficult. Here are the questions I am absorbed by right now: Are there more insights and expressions available in this image for me? It will require a certain amount of deconstruction so that some space is created to reenter the work. I didn't realize it would be this problematic. I want to have some idea of both the steps and the outcome so I can relax into the work. Otherwise, the process is aimless and goes down a blind alley very quickly. So, as artists and scientists how do we decide or choose the specific method to answer a question? Well, I suppose we first need to refine the question. What am I trying to communicate? What problem am I trying to solve? What insight am I trying to uncover? Can I answer these questions in a conscious rational way or do I need to allow my subconscious mind to hit on a solution? Either way, I’m stuck. I enjoy the image the way it is. Is there any room to move beyond what it is now? Is that what we mean by “finished”... no more possibilities…. complete and self-contained? It’s like a small death. I turn to the section of Leonard Shlain’s, Leonardo's Brain on creativity and insight. The right hemisphere goes on processing long after our conscious, logical left hemisphere has moved on to more immediate pressures. According to current neuroscience, this explains the sudden flash of insight that happens after we stop thinking about a problem consciously and rationally. The solution bubbles up later into consciousness sometime while our left hemisphere is otherwise occupied. The theory is that there are times we need to shut off the language and linear processing such a logical evaluation in our dominant left hemisphere to let the right hemisphere to come up with more creative solutions. So, I went to my studio today to prepare a large wooden cradle for something… not sure what yet. Then I came back to my computer and played with Mapping Manhattan layered on the wood surface in Photoshop. Here are some results. 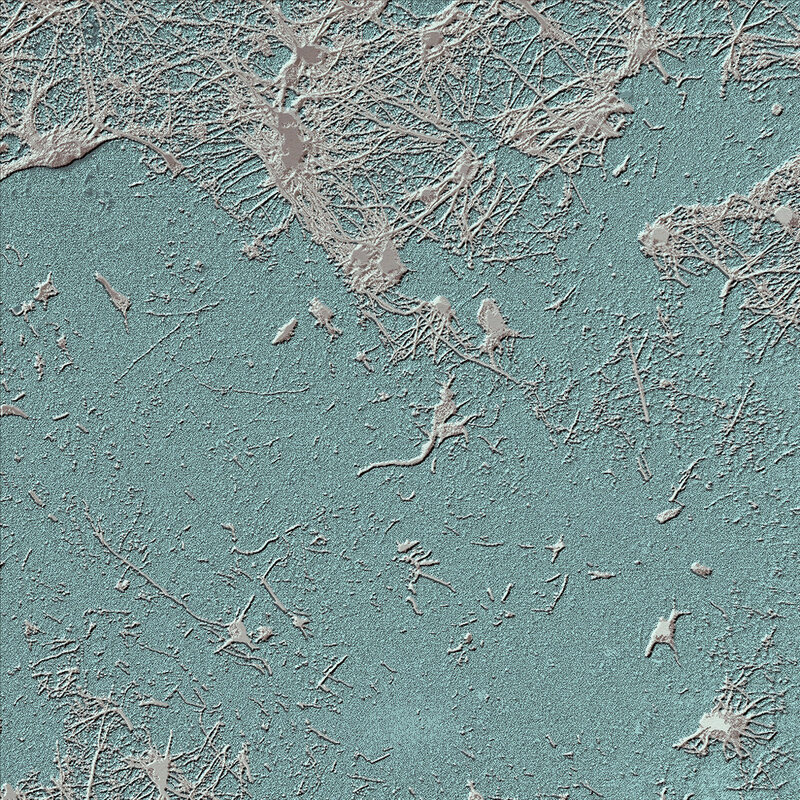 Yana and I have been exploring her electron microscope images of neuron networks, some of which I have rendered using Photoshop. I do this as a way into the image to better understand its structure and possible interpretations. Images initially evoke an intuitive response, especially when we are not told what the image is about. 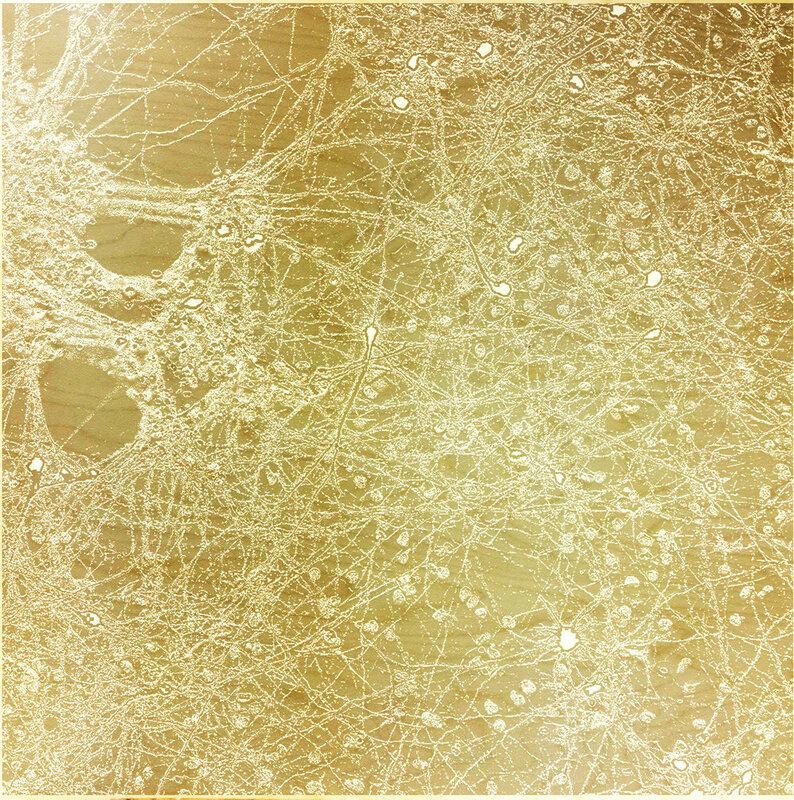 Yana’s images of neurons made me think of networks and in some cases, the disturbance of a network. I have always been interested in the idea of complex connections at all scales of human experience: nerves, blood, lymph, lungs, leaves, roots, the food web, migration patterns, rivers, roads, flight paths, hydro lines, social media, the internet … they seem to pop up everywhere we go. These are connectors that both communicate and exchange. 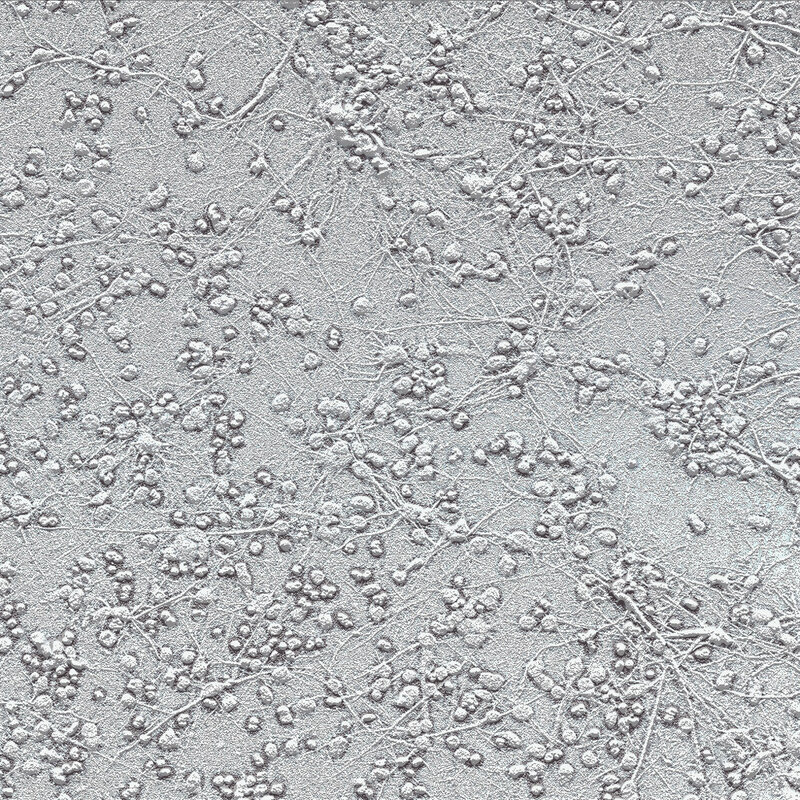 The essential pickup and delivery system required in profoundly interdependent world created by collections of cells and other natural processes. So what happens when we cannot connect, particularly socially. Are we slowly deprived of our needs? I would say ultimately, yes! We need our connections but they can exist out of our line of sight or under our skin. If we are always conscious of our need to connect, we become overwhelmed. Our subconscious is meant to deal with those underlying processes because our conscious minds are not very good at it. We are supposed to be paying attention to what is going on in the moment. Processing complex sensory input, making snap decisions that require the information of the present. Trying to connect all of the time through social media or our online presence can interfere with our ability to pay attention to what is relevant right now. I think it can interfere with the unique experiences that make us individuals but of course, it doesn't have to. After an interesting Skype call with Yana and Kate my brain is buzzing with ideas. We talked about the legal constraints of lab books for scientific purposes versus the freedom and consequent privacy of artists’ sketchbooks. This led into other questions we have discussed previously about the role of imagery in science or art and the importance of visual material for clarity, accessibility, aesthetics, engagement and persuasion. All of these aspects of visual “information” I hope to think and write about at some point. Since Yana and I decided to use this conversation as a jumping off point for our individual blogs...let’s see what happens. As I leaf through my sketchbook, looking for insights, I keep returning to the idea of sketchbooks as the private realm of an artist. Sketchbook images and their role in the artistic process are very different from exhibited artwork that is meant to be responded to by the viewing public. Yana pointed out that labbooks are part of the public record of scientific research and in that way have legal and practical constraints and requirements. I am sure that this is also an interesting window into the differences between scientific and artistic inquiry. My paintings are finished works that have a fairly well defined process and are meant to be displayed in a public setting such as Stillness. My larger paintings and drawings are more purposeful than sketchbook images because they culminate from a number of ideas and often even merge different images together. Even when they are fast and expressive, like Machine below, my paintings are based on lots of experimentation in my sketchbook first. At my last art show, a number of people asked about my sketchbook work of faces that I sometimes post on Instagram (darcyelisejohnson). I do not develop these drawings into public work because they are a spontaneous attempt to capture personal feelings and expressions as an insight into the human psyche. Because of the transience of mood and emotion, these drawings are done intensively and quickly. The images pass away as quickly as they come. They are difficult to translate onto a large ground while maintaining their freshness and purpose. There is likely another reason that I do not exhibit or develop these images. They are deeply personal and somewhat raw. Some artists use that type of imagery to evoke empathy and curiosity about the human condition. For me, the two sides of my art reveal the two sides of me. 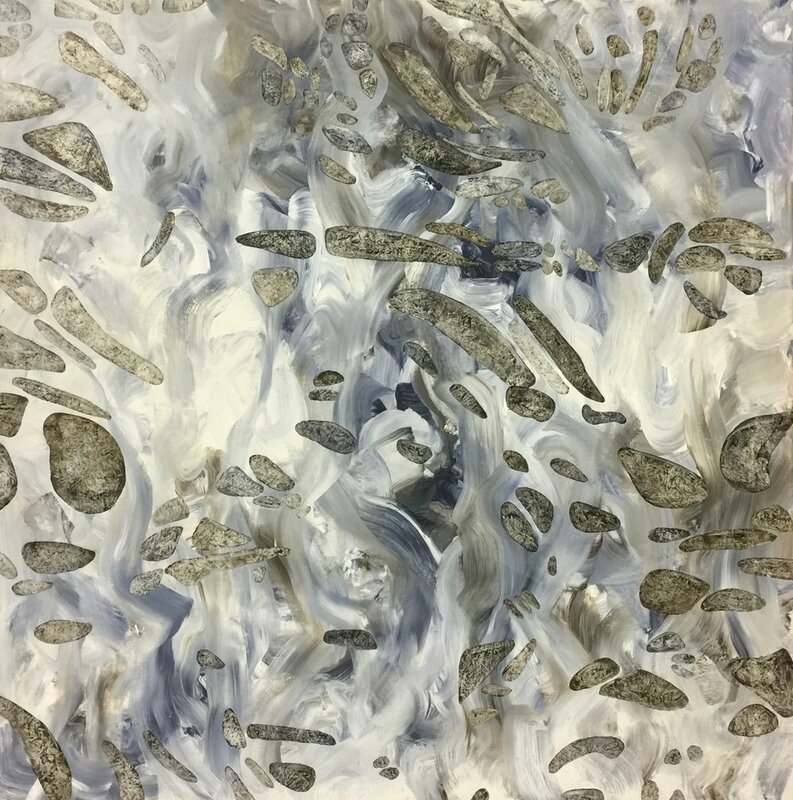 The thoughtful, abstract thinker that keeps emotion at bay while harnessing its passion for newness and discovery. The other side reveals a troubling emotional life that I also have to control. I suffer from clinical depression that began in my teens and set my life on its trajectory. So, I am attracted to science because it requires that we recognize and set aside some of our less objective experiences and rely on the quantifiable, systematic observations and analysis. Art making allows both sides of my personal experience a voice...albeit at times, a very private voice, in my sketchbook. This past week, Yana and I have talked about the process of planning and making art. At what points in the process are we consciously problem solving as we go and when does the imagemaking become responsive, immediate and subconscious. Many visual artists use sketchbooks to plan larger more finished pieces but I often do the opposite by drawing spontaneously in my sketchbook to inform a larger more deterministic finished artwork. I think the interesting question is how does this image development process look for each of us. What are the ways in which we create images; when are they analytical and when, intuitive? I use my sketchbooks to play. I draw randomly and responsively, I would say intuitively. I work into images I have started months or even years ago. I explore and experiment constantly. Many of my sketchbook images are abstract drawings. I am powerfully drawn to abstract images because I don’t want to be distracted by a recognizable image. Evenso, My abstract sketchbook drawings are often evocative of the natural world and its laws which, makes me question whether there is ever any abstract images that do not carry in them our more concrete experiences of the world whether we are making or viewing art. See this article by Eric Kandel, What the brain can tell us about art and the idea of the beholder’s share by E. Gombrich and E. Kriss. One way I “study” my intuitive drawings for their content, insights and possibilities is digitally. The following series started with a photographed sketchbook drawing which I worked up into a series using Photoshop. The series is called Macromolecule because that is what I was thinking about as I rendered this series. When I drew it originally in my sketchbook, no such evaluation was in my mind; it was an open ended drawing with many possible interpretations. To bring this process into the collaborative work that Yana and I are doing, she suggested that I render some photos of her neurobead work. This was a very satisfying way for me to explore her imagery. I was working with the idea of the beholder’s share. Briefly the beholder's share is the life and art experiences we bring with us whenever we view a piece of art. Art pushes us to see the world in a new way but that view must also contain our previous experience of art . Our responses to art must be primarily intuitive or subconscious because they are informed by the complex and layered memories all of which cannot be conscious in any given moment. Below are several digital renderings I did of the original photo Yana sent me. I am so excited to begin this residency. It feels so right!! Thank you to the SciArt Center for this opportunity. Yana and I have already had interesting exchanges and I suspect it will be difficult to narrow the possible collaborations to only several topics. 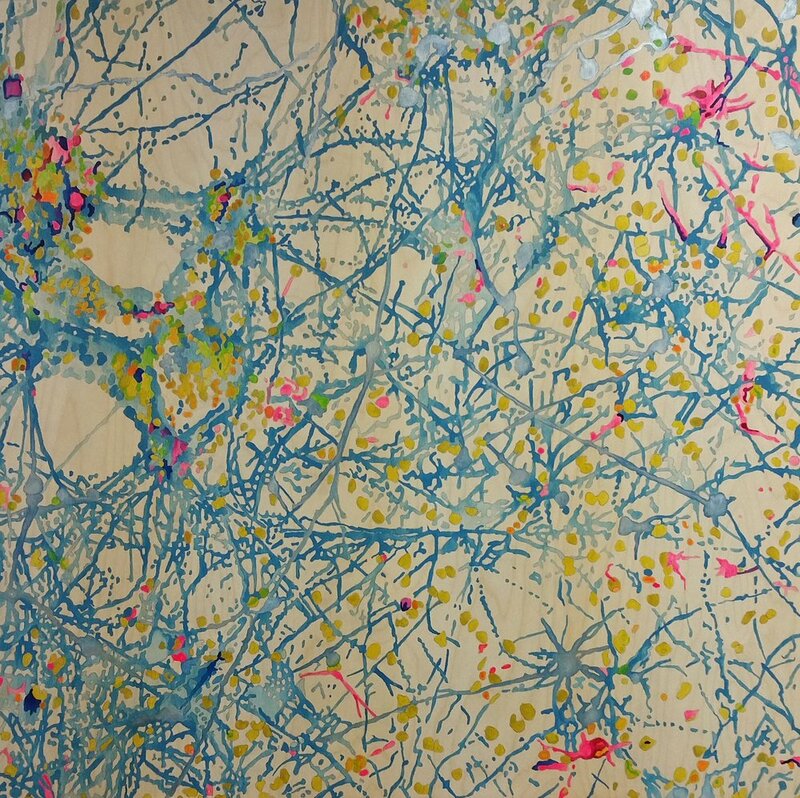 We have talked about the artistic representation of neuronal activity, why art is pleasurable to look at, what is the drive to make art, systems biology and networks… and more. Years ago, in the 1980s as I studied neurobiology and cognitive science at university, there was very little conversation about the way the arts and sciences intersect and inform each other. I was an anomaly because I was passionate about them both. Even though I was expected to choose one or the other, I never did. I understood the connections between science and art in terms of the more obvious qualities they both encourage; curiosity, focus, drive, creativity, problem solving and fascination with the material world. However, the real connection for me is that I see them as almost the same thing. The desire to observe, experiment and analyze phenomena in order to understand the world around me and myself. So, I’m greedy and wanted it all. Science appeals to my systematic evaluation of experience in order to bring the picture of nature more fully into focus. Art is the gestalt expression of my understanding of the world in the moment. I love how art and science both make room for newness and both have different modes of communicating their ever-evolving body of knowledge.They nurture the changing face of understanding. There is room to learn, change, move and breathe within scientific and artistic work. I have been teaching Science, Psychology and Visual Art for twenty years, mainly to senior high school students. I have been a working artist most of my adult life and produce mainly abstract paintings and drawings. My imagery is about the biology, thought, memory and cognition and also broader scientific models such as motion, gravity and dark matter. I move between making images in several ways. At times I proceed in a process of predetermined steps governed by rules in order to observe specific outcomes. Other times, I draw and paint expressively and unselfconsciously and that is also very informative. Below is a piece that began as expressive drawing and then was carefully rendered. Finally, scientific experimentation and making art have another interesting parallel in that “failure” matters as much as success. When the results do not work out as expected, it requires honest evaluation about why and then informs the next step. This of course, applies to most of life but I believe, the way we educate has failed to emphasize this until very recently. 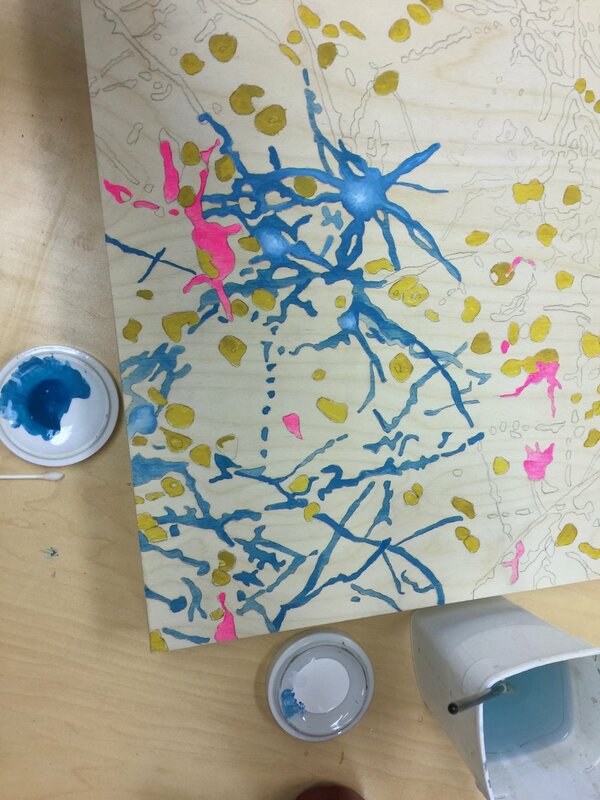 Because I may me the most absent blogger known, I have decide to post my SciArt Residency blog here to try to make up for it :-). So over the next few weeks you will be able to follow my posts here as well as on the SciArt Center Bridge 2018 blog. I encourage you to also read Yana’s blog as this is collaborative process. Yana and I talk a lot about our tandem entries and they spark off each other in interesting ways. Please come to my upcoming art show at 205-335 Wesley Street, Nanaimo, BC on the weekend of November 24-26, 2017. See the poster below. I will post images of the work after the show. I have always loved to write and talk. The flow of words that magically self-organize and trace out (my) thoughts and emotions. Over the last few years I resort to writing as much as I do artwork for self-expression. I read recently in an essay by David Foster Wallace that the urge to write is a way of confirming our existence. To paraphrase… “I write, therefore I am”. I can extend that idea to art-making as well. I write, draw and paint to see and more clearly understand my inner life. I assume others do the same. Perhaps we all construct and create consciously or unconsciously in order to leave our unique trail in the world; to reach out and make connections with others and the world we all occupy; to confront uncertainty and to share insight and exuberance; to feel less alone, more alive and substantial. Along with reaching out and touching the world around me, I want to gather the world into myself. I express artistically the intricate biological world that sustains me. I also love the built world and the ingenuity and aesthetic human desires it reflects. The ugliness of human endeavour is at the same time obvious as we commit travesties against each other and the environment. I try to accept that I am not only an observer, but also the enemy. So in these ways art, whether written, drawn or rendered in colour and texture, is to make the world and my place in it more accessible. To experience the beauty and pain or even the monotony of life as it is being lived.